One of the blind spots in forensic science, particularly in identifying unknown remains, is the inability of experts to determine how much an individual weighed based on his or her skeleton. 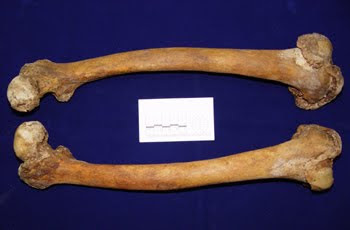 New research co-authored by CHASS anthropologist Dr. Ann Ross moves us closer to solving this problem by giving forensic experts valuable insight into what the shape of the femur can tell us about the weight of an individual. “This research allows us to determine whether an individual was overweight based solely on the characteristics of a skeleton’s femur, or thigh bone,” says Ross, describing the research. However, Ross notes, this research does not give us the ability to provide an individual’s exact weight based on skeletal remains. Researchers found that the heavier an individual was, the wider the shaft of that person’s femur. The researchers hypothesize that the femur of an overweight person is more robust because it bears more weight, but also because overweight individuals move and walk differently to compensate for their greater mass. Read more about this exciting new research. The New York Times featured the research in its science section.